My partner and I drove by a Sharper Image store today and, being the gadget geek that he is, he just had to stop and browse. As he remarked, Sharper Image is a chain built completely on products you will never need. Items such as the "rainproof" electronic meat fork with built-in thermometer. Or the lighted pepper grinder. And, not too far from the atomic clock that was 1.5 hours behind the correct time, was a true sign of the apocalypse. 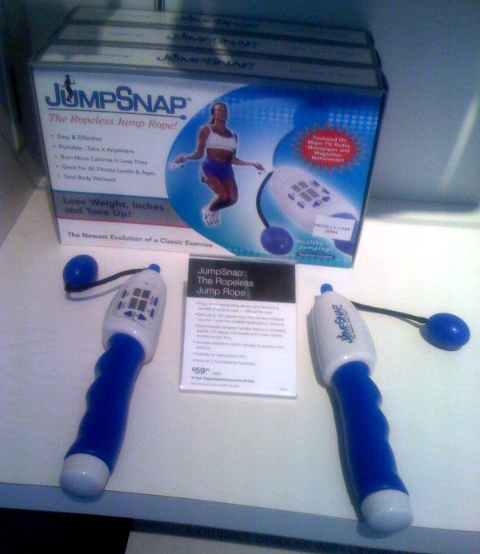 Of what possible use is a ropeless jump rope? If there's no rope, then it's not really a jump rope is it? I guess this gimmick is for people who can't count jumping jacks.